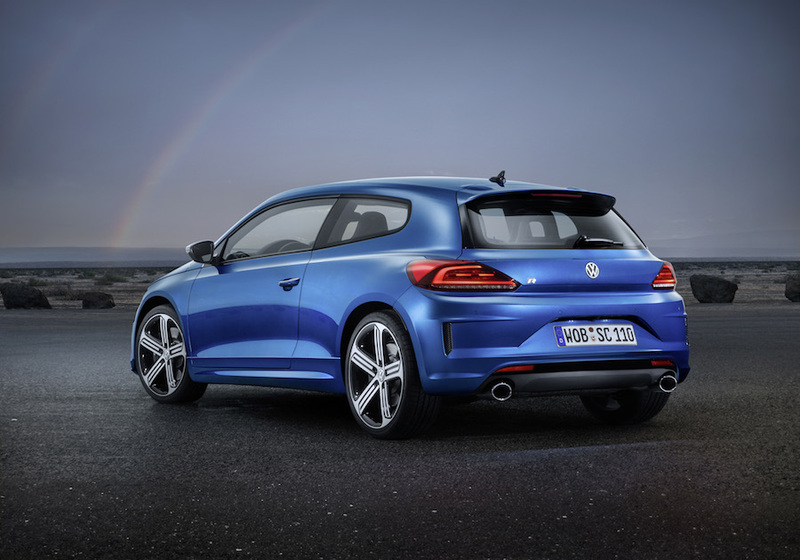 Can you believe the current VW Scirocco has been on sale for almost six years, since being unveiled at the 2008 Geneva Motor Show? No, we couldn’t quite believe it either, but regardless Volkswagen will be showing off a revised version in Geneva next month. To even call it evolutionary is probably an overstatement; this is quite possibly one of the subtlest mid-life facelifts since … well, the new Volkswagen Polo. Still, the Scirocco is a handsome beast so to mess with it would be unnecessary. As such, we’re left with just modified front and rear bumpers, upgraded head lights, new LED tail lights and a VW badge which doubles as a boot handle on the stubby coupé’s hatchback. So it looks pretty much like the previous version, just with some extra trinkets in the shape of integrated indicators, daytime running lights and fogs on the Golf GTI aping front bumper. Spot the difference? Rear end is very subtle in the changes made. In all honesty, we’re not overly sold on this new front bumper for non-R models. Perhaps it’s just the promotional pics VW have used, but the addition of Mk7 GTI ‘aerodynamic blades’ has created an squared-off front end that looks a little tacked on. In short, we preferred the wide gaping mouth of the original, but we’re splitting hairs to be honest; it still looks good. The R looks much the same as before, with bespoke bumpers and the addition of 18″ ‘Cadiz’ alloy wheels which are also featured on the new Golf R.
ESM was also a little surprised, and somewhat ashamed, to realise that the Scirocco R hasn’t actually been on sale since last year, due to the 2.0 litre turbo EA113 engine’s inability to comply with EU emission targets. As with the rest of the range, the R gains a new engine that complies with EU6 emissions regulations, whilst also boosting power and increasing economy. 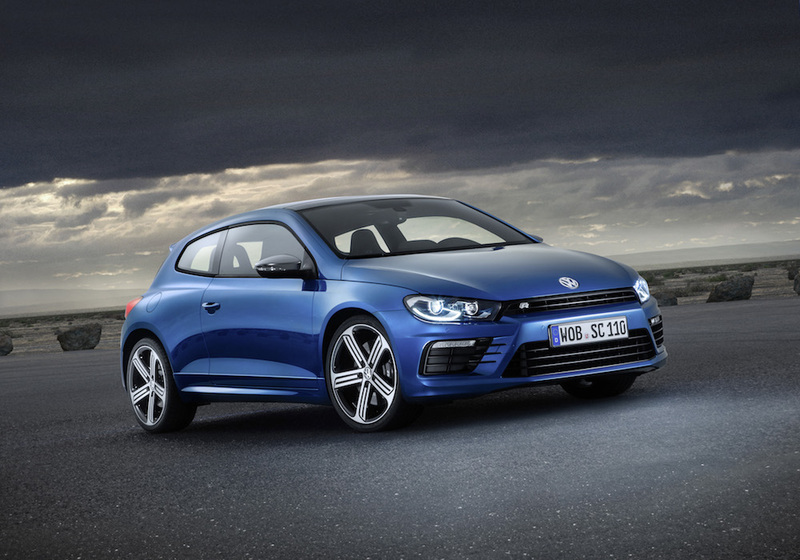 Using the EA888 from the Golf R, the new Scirocco R will pack 276 bhp (yes, as much as old school Japanese performance cars) marking a 15 bhp increase over the old model. It will, however, remain front wheel drive only unlike the 4WD Golf R.
Across the range, the rest of the engine choices have also been enhanced, starting with the petrol 1.4 litre TSI unit that sees power increase from 120 bhp to 123. A version of the 2.0 litre TSI engine (with 177 bhp) replaces the old 158 bhp 1.4 litre petrol offering, with improved economy despite the higher power output. The 207 bhp 2.0 litre TSI motor now packs and extra 10 bhp, bringing the total to 217 bhp but, somehow, also offering an extra 19% fuel consumption. Ever popular, two versions of the 2.0 TDI diesel remain, now available in 148 and 181 bhp flavours. Six-speed manual gearboxes remain standard, with VW’s twin-clutch DSG ‘box on the options list for all versions. Note those three extra dials atop the dashboard. Finally, the interior has also been subtly changed with new instrument dials, minor modifications to the dashboard and the addition of a set of three auxiliary gauges above the centre console. Designed in homage to the original Scirocco, which was revealed at the Geneva Motor Show in 1974, the chronometer, boost pressure and oil temperature gauges are a nice retro touch. You can place your orders from May, with the first examples set to roll off the Portuguese AutoEuropa production line for delivery in September. Pricing and final specification is yet to be confirmed by Volkswagen, but ESM wouldn’t expect much change to the current structure. Further information available from Volkswagen in due course.